The book’s eye catching cover was designed by Sally Eustice from Newquay who donated her time and skill. Cleverly woven in to the artwork is the Cornish crest and the Rodda’s logo as they are generous supporters of many Cornwall Hospice Care events. 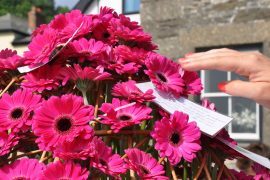 The book with its wipeable pages, has been printed by the St Austell Printing Company and is raising money to help fund the care provided by the charity to terminally ill people in Cornwall and their families. “Some of those who’ve provided stories and recipes have a link to our charity, but others just wanted to help a Cornish charity providing support for people in the county. 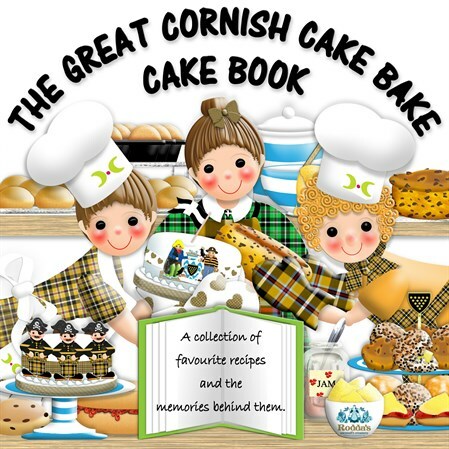 All the money raised will stay here to help us continue to do what we do best” says Judy the self-styled Great Cornish Cake Bake Cake Book Co-ordinator. The book also features pencil drawings of the charity’s two hospices, Mount Edgcumbe in St Austell and St Julia’s in Hayle, donated to Judy by architecture student Paul Lynch. They accompany a slightly different recipe showing what makes Cornwall Hospice Care the charity that it is. The book, which is on sale for £6.99, introduces such delights as Fat Nanna’s Dundee Cake and Eastbourne Pier donuts and features people like Doreen Donnithorne who’s still baking in her 91st year. “Doreen’s Marmalade Thatch Cake is one I had never heard of before”, says Judy, “and is as appealing as Sheila’s Sticky Ginger Cake and Graham’s Gypsy Tart. The book is now on sale in most Cornwall Hospice Care’s shops, there’s 31 of them stretching from Bude to Penzance – click here to find your nearest one. For UK buyers further afield the book is also available on Amazon which is already proving very popular. “The book first appeared on Amazon on Wednesday 21st June and within an hour we’d sold two copies, one of which was heading to Bristol!” says Judy. To buy direct from Amazon click here. And to make sure that our friends overseas are able to get their hands on a copy please email Judy at jlawton@cornwallhospice.co.uk who will arrange payment and overseas postage with you.